Thus far, I have avoided the topic of vaccinations on Eco Child’s Play for several reasons. I am not a doctor, nor would I ever want to pretend that I know more than someone who has gone to medical school. Also, much of the information I know about vaccinations is outdated (like the presence of thimerosal in all of the childhood vaccines). Lastly, my family’s choices have changed over time, from being staunchly opposed to any vaccinations to picking and choosing protection for our children based upon our son’s congenital heart defect. Finally, I feel like there is a straightforward, quality resource for parents in Dr. Sears’ The Vaccine Book: Making the Right Decision for Your Child. I wish I would have had this book six years ago, when my first child was born. 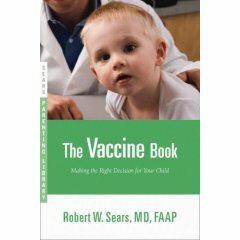 The remaining chapters of The Vaccine Book discusses combination vaccines, safety research, side effects, ingredients, myths and questions, information for parents who chose to delay or decline vaccines (including Dr. Sears’ selective vaccination schedule), and “What Should You Do Now?” I am very pleased to see that Dr. Sears’ selective vaccination closely matches my family’s choices, with the exception of rotavirus. His advice has matched those of my own pediatrician and doctors, and it is reassuring to have this resource when considering any vaccine for your child.Dr. Robert (Bob) W. Sears is the son of the infamous Dr. William (Bill) Sears, best known for promoting Attachment Parenting. To visit Dr. Bob’s vaccine blog, click here. This blog is updated with recent vaccine news, such as the Merck recall, as well as resources for doctors and families seeking “vaccine-friendly” doctors. There are so many issues involving vaccinations, such as state requirements and the use of animal/human tissue, that Dr. Sears does an amazing job covering the subject. As a friend of mine who is a pediatric nurse practitioner explained to me, “Your child will probably be fine if you vaccinate; your child will probably be fine if you don’t vaccinate.” Of course, this statement applies to children in the United States. Were you reading my mind today. I am struggling with this and need to make her appointment to go in. She is due for her next round. Thanks for the tip on this book. It sounds like I need to read it. Yes, Sheri, get this book! You will feel empowered to make decisions, and it can prompt an honest discussion with your pediatrician. I only scratched the surface in my post of what information is contained in The Vaccine Book. Since Dr.Sear’s office is in my neck of the woods, I know that while he advocates vaccine’s he is respectful of those who choose not to vaccinate. I have several freinds who do not vaccinate their children who go to him. That open-mindedness makes him and his sons terrific resources for objective information! BTW- I too pick and choose and like you, started in one direction and started in the other. I think it’s great you and Dr. Sears pointed out how vaccines are important not just from the point of view of protecting individual children, but also as a public health issue — that’s a key issue that occasionally gets lost in the discussion of vaccination. I would rather not vaccinate. However, the only thing leaning me towards getting her vaccinated is where we live. Houston has a large amount of illegal immigrants. Plus a lot of people coming and going from other countries. I know how you feel Sheri. I have come to grips with the fact that my daughter needed vaccines to protect my son. Some of these illnesses could be devastating for him, so I am thankful that I live where I do and that the majority of children are vaccinated. I also recognize that should we travel, we would need other vaccines. If we lived in a metropolitan area with a lot of international travel or immigrants, I might make different decisions. Your public health department should be able to provide you with statistics on various illnesses/diseases for your area, as doctors and hospitals are required by law to report certain illnesses. Those statistics might help you make your decision. I’ve been reading The Vaccine Book along with a few other texts about vaccination. While the tone is fortunately less biased than most of the texts (whether for or against) out there, the headings he chooses do say alot. Rather than “Should you give your baby the vaccine (including both reasons for and against…)”, as you put it, the headings are more along the lines of “Reasons to get this vaccination” and “Reasons some people choose not to.” Seems to me that a truly unbiased author would at least give those two equal credibility, no? My advice is to read the book, but don’t keep your critical eye closed just because everyone says Dr. Sears is objective. It is true that I paraphrased Dr. Sears’ headings. I hope that I did not portray Dr. Sears as unbiased, as I am not sure there is a medical doctor out there who is not swayed by public health issues when it comes to vaccinations. I do find that this book gives the most straightforward information from a western doctor’s perspective. As a parent, I am honestly more concerned with my own child’s health over public health, but there is no doubt that the two are tied together. For example, I have chosen to immunize my daughter for pertussis, because this illness could be devastating for my son because of his pulmonary arteries. If I had only her interests to consider, she would not have received this vaccine, and I am so thankful for the vaccine requirements at school for his sake. But as I mentioned in the post, we have not fully vaccinated our children, so I guess I am a hypocrite. I am looking for a vaccine-friendly pediatrician in the Houston area. My daughter is due for her next round of shots and I’d really like to get her on Dr. Sears’ alternative vaccination schedule, but I don’t know how to go about finding a new pediatrician. Any help or recommendations would be appreciated! Desiree, ask your friends..if they don’t know, you can call different doc offices and ask the receptionist how each doctor feels about vaccinations and parents making choices about them. Also, you could ask a parent you see at a coop or health food store if they know of any in your area, as I would think someone shopping organically may also want to do a selective schedule for vaccinations. I think there was a part in Dr. Sears’ book that discussed how to find a physician open to your concerns. I don’t pretend to have training in medicine either but I don’t think the way our Dr.’s are trained in the this country, at least on the conventional side, is the right way. Most of them are brain-washed drug pushers and vaccines have become another way of big pharma making more and more money. As more and more children get sick (vaccinated children that is), from a myriad of messed up things like autism, people may finally wake up and stand up against our government. We are just cattle and an overly medictated and vaccinated herd at that. I prefer staying away from Dr.’s and taking great care of myself w/ high quality vitamins from a food source and do the same for my children. We never get sick and never need the Dr. It’s pretty simple really. Our friends in the Netherlands do the same and everyone they know there stay fit and well. I think too many folks in this country are just too easily convinced to do what their Dr.’s tell them. They let fear get the best of them…it’s really such a sad shame. I am following Dr. Sears advice on the alternative vaccination schedule. My pediatrician was hard to convince, but I pushed until he agreed. I understand that the doctors worry that if we venture too far from the usual schedule, parents will fail to return for the follow up visits/shots. However, I’m not one of those parents. My son will receive his vaccinations in line with the alternative shot schedule. I am just so happy to have a book like this at the perfect time and I also have an open minded pediatrician who is willing to work with me on getting the right vaccine schedule for my child. I would highly recommend this book to anyone who has any concern about vaccination. It’s worth the read! As a junior doctor, I truly believe that people should NOT have the right to decide against vaccinating their children. It’s too dangerous. Yes, there are some risks, but these far outweigh the benefits in the vast majority of cases. Vaccines are purported to REDUCE THE RISK of the infection, and they are not a guarantee. Likewise, condoms are not a guarantee that you wont get pregnant. But does this mean you just wont use them either? Honestly, people shouldn’t be allowed to place all of society at risk because of what some nutcase with a bee in their bonnet regarding doctor’s ‘real motives’ says. I, too, am in Houston/Katy area. Any luck? I am hoping to get the mmr shot separated. Although my pediatrician is tolerant of my schedule, she doesn’t order the separate shots, so I’m looking, too! Thanks! Desiree– I have chosen not to vaccinate my daughter–so far. My doctor is fine with this, although of course he prefers vaccinations. He has many parents who choose not to vaccinate and will respect your wishes as to when (or if) to vaccinate your dd. His name is Dr. Keith McPherson and he is with Texas Children’s Pediatric Associates in Conroe. As far as I know, most doctors in this area (around The Woodlands) are pretty respectful of the parents’ choices. I am with you. I’m looking in the Katy area also. Have either of you had any luck? My daughter is due for shots soon and I know I will be scolded by her regular pediatrician (as usual). I am really needing to find a good, vaccine friendly doc here in Katy or around the Houston area. I have to say, I am currently sighing a breath of relief scrolling through all of the comments. My family moved here from Orlando recently, and I took for granted my wonderful pediatrician there. He was so supportive and respectful of my belief system regarding the delaying and declining of vaccinations for my babies. I have had two horrible experiences with Humble Pediatrics. I am so disappointed with the level of professional courtesy I was shown by our doctor and nurse MaryAnn. She did not so much as afford me the slightest level of respect. Furthermore I was sickened by her extremely uncompassionate behavior toward my children. I felt like I was the only parent ever to grace their office without the sheep-like mentality of most, and maybe I was just too much trouble for them. Rest assure I’m looking for a new doctor today. Farik (and others), If vaccines do such a great job protecting everybody, and an unvaccinated child gets a disease, shouldn’t everybody be safe (assuming that the vaccine really does what it should do)? Everybody should absolutely have the right to decide. My daughter has never had a vaccine (she is 2), and she has never been sick. My coworkers with children are out every couple of months with their children being terribly sick. Is it that difficult to see the connection? I am looking for a WHOLE HEALTH Pediatrician in the Conroe/Woodlands, TX if anyone has any input. Studies are showing a definitive link between autoimmune diseases in adulthood, i.e., MS, Crohn’s, rheumatoid arthritis, LUPUS; that are CA– USED by lack of exposure/reducing fevers/disabling our children’s immune system “learning” process. I have spent many years researching and developing connections in my community that support holistic beliefs with great success. Now my oldest baby has her first baby and we need a good pediatrician who will support her and guide her when needed. FARIK – What is your opinion about the 55,000 + children in India who are now suffering with polio type virus because of their vaccine and about the severe increase in autism and autistic spectrum disorders on boys? I am scared to death of vaccines! I have a 14 year old daughter who is supposedly fully vaccinated, and a 9 month old whose vaccine chart has way more scheduled vaccines? All these issues children are having now with autism, ADHD, seizures, some basically dying, all after vaccinations. It’s like am I giving my baby girl a fighting chance at life if a vaccinate her or not??? Why are there more sickly children in the world/united states now than ever before? My anxiety level is on a thousand percent when we visit our pediatrician. On top of that it’s almost as if he gets angry when we ask questions?! He’s a very good pediatrician and reviews are very good so we go there. My wife and I have been back and forth with all this. She’s all for them and I’m kinda not. Seriously lost and confused with all this. I would die inside if my baby girl had a complication from a vaccine I allowed a dr to give her! Help!!!!! I understand. Maybe you can find another pediatrician to discuss it with? Or perhaps you can talk with your current pediatrician about a modified schedule.